5.0 out of 5 stars Possibly the most important book you'll ever read. It is rare indeed, when a book of this monumental importance comes along. For contained within its covers, are answers to all manner of questions spiritual seekers will certainly ask along the path. It appears that every possible topic has been covered in this book. Just a few examples include: healing, meditation, dreams, quantum physics, universal laws, descriptions of the non-physical realms and much more. Reading Our Ultimate Reality has left a profoundly deep impression on me, as I have been a seeker for most of my life. The brilliance of this book, is both that the author details all the subjects so clearly, and that these details all ring true for this reader. My advice to anyone interested learning what their ultimate destiny is, and the true nature of this multi-dimensional universe, would be to read this book. Adrian is truly a gifted Spirit. His newsletter is also fantastic! Can't recommend enough. I am an NDE experiencer, so I "know" some things about Spirit and Adrian is correct. A very generous Soul. A real jewel, Our ultimate reality is very well writen book, that unveils the truth of our reality, writen by a 20th century Avatar, "Adrian P. Cooper" a wise man of our time, and it triggers our mind into a reactive state, awakening our true essence, maiking us realize what we truly are. 5.0 out of 5 stars I have FINALLY Found. OMG...Adrian Cooper! Let me start off by saying this: YES! I am a SEEKER and I have been Seeking for the last 20 years...I have READ EVERY New age Book on the market (Texts on Buddism, Hinduism, Taoism, Christianity....Books By Doreen Virtue, John Edwards, Ekhart Tolle, Sylvia Browne (Even her Novus Spiritus Tenent Books I bought! ALL OF THEM!) and Yes, I have "connected" with many, many books on the subject matter But, NEVER Have I Found IT ALL IN ONE BOOK!! I can't even put it down...I keep saying..."This is It! This is it!!" ... THANK YOU ADRIAN COOPER! Thank you for your PROFOUND BOOK! It is Definately the "Ultimate Reality" for me...MY TRUTHS From Cover to cover....Exceptional Writing, reseach and communication on EVERY SINGLE Chapter in this Book! I know you Were led with the Writing of this one... You just HAD to be...This is the Book I have DREAMED of Writing...CONGRATULATIONS...You beat me to it! *Smiles* ...and I don't Begrudge you not an instant of success...I will move onto Writing about "Autism" and the Connection with the Spiritual aspects of seeing an "Autistic person/Child" in a new light .....a "Spiritual Light" ...and I will continue on with my "NEW AGE Fiction Writing" I know I will someday join YOU On the "BESTSELLER" List! or at least to have an opinion. Very articulated. For the seekers is a very good reading. I follow his newsletter and I waiting for a new book. This book is full of info for the age we are entering. Time for all to break from the old I,I, Me.Me reality and create an Us, Us,We, We, way of being...Be Peace....Albert Russell "The Dauntless Adventure"
5.0 out of 5 stars Our Ultimate Reality. Amazing book. I have not been able to put it down. So much information on our lives in the Universe. Well worth any ones time if your looking for enlightenment. A Must Read! 5.0 out of 5 stars WOW!! This is the best book I've had the pleasure of reading in a very long time! It has answered many questions regarding the meaning of life and other questions from other material I've read on this and other deep subjects! Wonderful! 5.0 out of 5 stars Our Ultimate Reality, Life, the universe and Destiny of Mankind by Adrian Cooper. I highly recommend this book to everyone who is on the path to truth. I have searched and searched and searched. I now realize that it came when my life was ready. 5.0 out of 5 stars Very deep and informative book. This book is excellent. It is full of information and I enjoyed reading and going through it. I also enjoy the newletters that Adrian Cooper sends out for free. ( http://www.ourultimatereality.com/ )The newsletter compliments the book and I am very glad to continue my learning. 5.0 out of 5 stars Good book. Good information. I'm glad it's finally in paperback. A lot of the information in Adrian's newsletters can be found in the book. 5.0 out of 5 stars Amazing Book. Rarely is a book so informative, and potentially life-changing at the same time. Even as a simple curiosity, this book could satisfy tenfold, and ultimately answer questions you didn't know to ask. Without preaching, hype, pretentious condescending, or trite exaggeration, Adrian Cooper approaches the unanswerable with amazing ease. You could indeed learn one's true role in life, in the universe, and as a compassionate vessel of knowledge and incredible potential, in the eyes of a God energy that some may see redefined. Somewhere between science and religeon lay many mysteries, and many answers, and this book dwells on most, if not all of them, with astounding insight. At worst, you'll get more than your money's worth with this book, and you'll be the most interesting person at the water cooler. Really, there is no good reason to pass this one by. 4.0 out of 5 stars Our Ultimate Reality. Its an amazing book that gets to the very core of your being. It illuminates the path that we need to travel to become who we need to be. 5.0 out of 5 stars Fantastic book. You will not be able to put this book down once you start it. Very informative. I also get Mr. Coopers newsletter. That is what led me to the book. Highly recommen it if you are just beginning or have been on the spiritual path. I am reading it for the second time. It will take many readings to get everything to sink in. Awesome book. A must read book. We are now approaching a different age and we must all become more conscious. Everyone should read this book, fantastic book. 5.0 out of 5 stars True eye opener. This is one of the most astounding books i have ever read that really makes sense of what is happening all around us and where humanity is headed in the future. I'm really enjoying this book anything that helps elevate consciousness is OK with me, the wisdom it evokes will bring forward the Spiritual evolution that is needed at this time. 5.0 out of 5 stars life changing. One of the most interesting books I have every read next to ,"The Science of Being".A must read for all,but only if your ready. "When the student is ready the teacher will come". assest for anyone to have the knowledge that this book exemplifies. 5.0 out of 5 stars All You Need To Know About Everything. ...well anything worth knowing anyhow. I don't think there's any chapters about "Dog" the bounty hunter here but there are 115 chapters about life,death and everything in between. Sort of a manual for living beyond the 5 senses and 3 dimensions. Really... this book is just filled, almost overflowing with spiritual/metaphysical information. Reminds me of David Icke's work in it's extraordinary thoroughness and detail as well as the sincerity in their desire to share their passion and knowledge. Pick up this and David's latest and you'll be set for reading material for a few days (close to 1200 pages worth} and you'll know just about everything! Pretty cool huh. Well that's my take on all this but if you wanna read about "Dog" and Britney then go get your Enquirer and have at it! 5.0 out of 5 stars My Search For Answers May Be Complete. The seeker of Truth is ever stumbling on and over entrenched dogma, and parental religious teachings of childhood. But now I am grown and knowledge has filled in many pieces of life's puzzle. Yet at some point, regardless of status, comes that moment of "some thing is missing in my life". So as many find, the quest for the "missing" can be a troublesome and confusing quest. Depending on the needs, wants and desires, many path ways are walked. Financial, relationships and health, are areas that consume most of ones beginning years of adulthood. A degree of success in any or all of these areas is comforting. Still, one can experience a nagging, deep within that calls for some thing more. For me it was along spiritual aspects, that my nagging thoughts kept bringing up uncomfortable questions. Little things like "how do I fit into the scheme of life"! Enters the bible, and study of metaphysics. Enters sense and nonsense. Unless one possesses blind faith in and through childhood teachings, only doubt and confusion exists after all the efforts to quench the nagging spiritual questions. Finally after a few year of searching, and rarely finding jewels, some excellent titles were found, that helped immensely. One of the more recent jewels being "Our Ultimate Reality" by Adrian Cooper. Within the 572 pages are many answers to long standing questions that begged any type of sensible answer. Not just a rehash of various concepts and thoughts, but a coherent resonance with "this could very well be the Truth being sought", and that is what I'm finding in this book.Yes I'm testing it all for "is this my truth", not only as "Our Ultimate Reality", but for is it "My Ultimate Reality". I think every single person on the face of the earth should seriously read this book regardless of their religious affiliation! Cooper explains and reveals things that they don't`t teach us at school or even in church, synagogues, or temples. Worth every dime spent! I really like how he connects the dots... Shows how the pieces fit together, even though most of us don't see them all. You can not read this book and not be amazed by the hidden truth. This will definitely change ones whole outlook of life for the better. 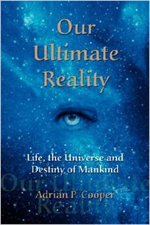 4.0 out of 5 stars our ultimate reality, life, the universe and destiny of mankind. A weighty book, not a Pema Chodron trip. Different. Full of interesting insights, I sort use it as a sort of " google" when unravelling a mysterious brain short circuit or some thing is ma king me uncomfortable, if you know what I mean! So no, dont LOVE it; yes, useful and I like it. It sits along with other wisdom spreading books and tapes by my bedside. Full of great information to think about. Although i may not agree with everything in it, that which resonate with me I do. If you are spiritually interested then this book is a must for you, it answers a lot of questions which we tend to ask our selves, it is very informative. A great read to have. The book is sensible, easy to understand and it is very helpful. It contains a lot of useful information. I would recommend anyone to get the book. What more need be said after reading this book. Our ultimate reality has assisted in providing most answers to my questions and more. Most importantly I now appreciate what my life is all about, which has given me a renewed sense of purpose. This book will most definitely appeal to all those people, like myself, who have been seeking answers to a lot of questions which we will all have thought about at some time.Such as Who is God? What is the nature of the Universe? What is our relationship to God and the Universe? Are we really co-Creators with God? What is our purpose for being here on earth? These and many, many more such questions are answered in plain understandable English. This book can be used as a guide to help you on the path to leading a life of health and happiness and at the same time having an abundance of everything you want or need. There are too many topics covered in this book to enumerate them all, but most spiritual seekers will find it a great help in defining who they really are and their true relationship with this great Cosmos. The subjects are clearly defined and will help those interested to follow their own path on the way back to the Divine Source (God), a journey we all have to make. My advice to fellow travellers would be to read this book! A detailed roadmap for the seeker of truth. For those who ask... What am I? where did I come from? and Where am I going to? This book provides many of the answers. A most profound read from Adrian P Cooper. This book will remain by my side forever! It is the type of book that you can't put down but also can easily dip in and out of over time. It provides possible answers for all of lives questions and certainly makes you re-think all of you preconceived ideas and believes. A fantastic book. Totally awe inspiring. Very vell written and can be understood by anyone, as the explanation is precise. A must have for everyone. A different look at the way religion, humanity and the universe are connected and interact with each other. First of all, there is much to be said for this book, as it does bring to together in one large volume many, many metaphysical concepts for the spiritual seeker. There is not much here that the New Age and Metaphysical-Knowledge seeker hasn't encountered before, but it does put it into one large book. There are a couple of things that would have made the book better for me and that is if it had included at least an index, if not a bibliography. An index is important to me if I just want to look up a particular subject. Secondly, the author gives his beliefs as facts; as truths, without stating how he comes to believe it or why he believes it. For instance, most of us have probably come across the idea of Every Entity evolving back to the Creator to become One in Unity with The All. 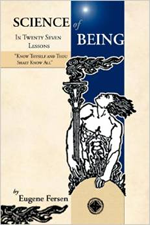 In the chapter on Reincarnation he states that we will have the choice to either relinguish our individuality and reunite with the Creator, or to retain our individuality as a God-person. This is different than what I've personally come across in my studies (Edgar Cayce states that we will "know ourselves to be ourselves, yet one with the Creator, one with the Whole"). Another statement made by the author is that plants possess souls. Where did he get that from? Yes, plants obviously possess a consciousness, and many studies on plants have verified that, but consciousness does not mean a soul, and until convinced otherwise, many of us won't believe such a thing. So I wish he would have CONVINCED ME-as in back up your statements with facts. So, yeah..some of his ideas are a bit different, but I would just love to know his sources for some of the statements that he makes. Obviously, we have to discern the ultimate TRUTH for ourself and not from a book, and we all know that when it comes to the Metaphysical and Spiritual, there is no ONE TRUTH. There are 115 chapters varying from one-half to 30 pages in length. Yes, there are 572 pages, so it is a big book and covers alot of ground, BUT there are many half-empty pages, 2 or 3 line-spaces between every paragraph, and the type is large, 12-14 font. Don't think you will get 572 pages of information. It is divided into three sections 1) OUR INFINATE UNIVERSE covers chapters on The Nature of Our Universe; Buddism; Hinduism; The Kabbalah; Definition of God; Quantum Physics; and a chapter each of the Principals of Mentalism, Correspondence, Vibration, Polarity, Rhythm, Gender, Cause and Effect, Telepathy, Remote Viewing, Karma, and more. 2) THE INNER REALITIES includes chapters on The Truth About Death; Ghosts; Animals After Passing; Reincarnation; Suicide; The Etheric Body; The Astral Body-The Soul; The Mental Body; The Higher Self; The physical Universe of Matter, Angels; there are many chapters in this section on the innner and outer planes; Guardian Angels; Communication; Psychics; Spirit Guides; Out of Body Experiences; Astral Projections, and much more. 3) REALIZING YOUR DESTINY has chapters on Relaxation; Concentration; Meditation; Healing; Out-Of-Body States; Positive Thinking; Prayer and Affirmations; Subjugating The Ego; Dream Journals; Selfless Unconditional Service; The Joy of Giving; Powers of The Imagination, and many more subjects. The object of this section is to teach as well as guide the reader thru various self-improvement-type exercises designed for spiritual growth, expanded awareness and metaphysical experiences. Overall, I would recommend the book, but it is certainly a bit overpriced for a book without even an index. So, perhaps buying it used may be a better option, although there were no inexpensive options when I purchased it. There's not a lot new here, but for the new spiritual seeker of truth, this would be an invaluable guide. The chapter headings are the only source of reference without the index, so this doesn't make a great reference book, but still may be worth the read.